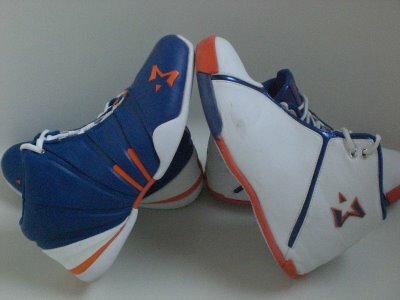 Almost a year and a half ago I read an article about Stephan Marbury and his shoe the Starbury. A month later I bought my first pair of Starbury’s for $14.98. Nearly every Friday I play with a group of guys. Initially the look on a few faces betrayed the typical, “I like your new shoes.” Understand I can afford Nike, Addidas or any other name brand shoe designed for basketball. But, when an NBA star undertakes to assist poorer families by providing a shoe he is willing to wear while playing the grueling schedule of the NBA, the issue becomes more than a matter of between brands. For many in a status oriented culture the shoes make the player. You could say in this case the player makes the shoe. Stephan Marbury reportedly recalled the strain on families to not only put food on the table but buy the latest name brand shoe to hit the hardwood. Single mothers were especially stressed wanting to provide the latest kicks for their children. How we spend our money does indicate what is important to us. Now I love to play basketball. Despite a cervical fusion at C5-C6, I still make it up and down the court quite well. I may not be the most adept scorer but I am no slouch on the defensive end of the court and love to rebound as well. I love shoes. I am not in the running for the Amelda Marcos award for best shoe wardrobe or anything, but I do like shoes. I do like good basketball shoes. A couple of weeks ago I laced up my original pair of Starburys only to discover I had worn them smooth out. Nostalgically I played my last pick games with them on. Once home I retired them to the garbage bin. There was no question about what shoes I would buy. I headed over to Steve and Barry’s at Crossroads Mall and to my surprise they were having an “Everything $8.98” sale. I picked up a pair of Starbury II’s. Their maiden voyage will come this Friday. Everyone notices new shoes. I will be excited to note my new kicks we under $10. They will wear as well as any of the Nike’s I have owned over the years. I often wonder at what point these kind of purchases could catch on among those who consider matters of justice important. I speculate over the money spent by our local basketball teams and my playing mates on Fridays. The issue is not what one can afford. The matter runs much deeper. Our spending reflects our values. If little by little many of us who consider these kinds of matters important would put our convictions where our pocketbooks, checkbooks or money clips were, think of the healthy cultural impact that could be felt.